VANCOUVER—If you step into a certain storefront on East Broadway in Vancouver, and walk around the black tissue paper screen, you see six, maybe eight, people sleeping in recliners under blankets, their heads and exposed limbs studded with tiny silver needles. You don't feel alarmed, though; the sense of tranquility takes over, relaxing your forehead. This is a typical scene at Poke Community Acupuncture. “In today’s world, it is so difficult to stay connected to one’s self,” says Darcy Carroll, owner of Poke, who argues that the shared stillness is perhaps as significant as the needles. Acupuncture is the millennia-old practice of inserting fine needles at specific points in the body to cultivate health and treat disease. It is effective in treating a myriad of physical and mental illnesses and every conceivable type of pain. It can cost almost nothing and, aside from relaxation and mood elevation, it is generally understood that acupuncture has no side effects. In Canada, most acupuncturists charge $65-175 per hour-long session, making it inaccessible for most people. A small but growing number of community acupuncturists—affectionately referred to as "acupunks"—are working to change this. Carroll opened Poke Community Acupuncture in 2009 on a busy street in Vancouver. Poke offers treatments on a sliding scale of $20-40. Patients are told, “You pay what you can afford,” no questions asked. Poke is open seven days per week, employing three acupuncturists and one part-time office manager, with 150-170 patient visits each week. (Carroll does not advertise; Poke's patients take care of that, grabbing fistfuls of business cards on their way out the door.) At Poke, patients are booked six per hour and are treated, fully clothed, in recliner chairs, in a group setting. This is the way acupuncture is traditionally practiced in Asia: many patients per hour and very little talking. Community acupuncture practitioners say that a collective energy field (known as “community qi ”) generated by several people having treatments at once enhances the effects of individual treatments. Up to eight people share the treatment room at a time, relaxing under blankets to the sound of soothing music (and steady traffic on Broadway). It is common to slumber among strangers for two hours at a stretch. A busy day in Poke is very, very calm. Patients at Poke are encouraged to stay as long as they like (“We do encourage napping,” Carroll smiles), letting the acupuncturist know with a look or a soft “ah-hem” when they’ve decided they are ready to go. For many patients this is new: their own bodies will know what’s best for them. Community acupuncture is a potent form of nonverbal community building, says Carroll. Healing in a group interrupts the isolation that often accompanies depression, illness and chronic pain. People from all backgrounds sleep deeply in recliners at Poke. “Community acupuncture as practiced at Poke breaks down class barriers, challenges the idea of value being attached to a price,” Carroll says. Effective pain relief without drugs or side effects leads to a more critical view of pharmaceutical drugs. "The group setting also disputes the concept of health as something that you consume, privately, if you can afford it. Instead, health is something you share with your community." Community acupuncture is growing in Canada. In Vancouver, Poke Community Acupuncture, Fir Street Community Acupuncture, and 5Shen offer sliding-scale acupuncture treatments. In Victoria, Hemma Community Acupuncture and Heart & Hands Health Centre are options for affordable acupuncture. A community clinic has sprung up in Nelson, BC, as have a handful in Ontario. Acupuncture is a therapy, and works best with regular treatments—a course of a dozen treatments, given at least once a week, is often necessary for lasting effects. People of average incomes generally stop after one or two treatments, not because they are apathetic about their health, but because they can’t afford the expense of multiple visits to the acupuncturist. Instead of achieving success by marketing their services to the wealthy, the community acupuncture model provides practitioners a stable income from many small sources. Carroll recommends Lisa Rohleder's manifesto, Acupuncture is Like Noodles: The Little (Red) Cookbook of Working-Class Acupuncture for any acupuncturist interested in exploring community acupuncture. The community acupuncture network offers a worldwide directory of community acupuncture clinics, as well as online camaraderie, inspiration and advice. In April 2011 the first-ever Community Acupuncture Network Conference will take place in Portland, Oregon. At the time of writing, at least four Canadian acupuncturists are planning on attending the conference. "I think we have enough practitioners out there who cater to folks with lots of money, or juicy medical plans," says Laurel Irons. Irons operates 5Shen, an accessible mobile community acupuncture clinic providing individual and group acupuncture throughout Vancouver. The five shen are the five psycho-emotional aspects of our selves, corresponding with the five elements in traditional oriental medicine. 5Shen promotes harm reduction and peer-led, client-centred services. Irons focuses on increasing accessibility to acupuncture and holistic therapies, especially among marginalized people who often don't have access to such forms of health. Locations include women’s recovery houses, BC's Queer Resource Centre and Positive Living BC (formerly BCPWA). Irons bills through Medical Services Plan, which covers 10 acupuncture visits per year for those on premium assistance (100 per cent subsidized health care for low-income British Columbians). "Folks living in poverty are in serious need of greater options around health and wellness, and we need more practitioners who can find a way to get involved,” she says. 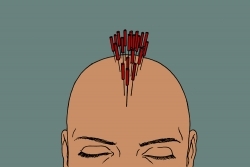 Last summer, for instance, Irons and a colleague offered free acupuncture aftercare to people returning from anti-G20 protests in Toronto, using the five-needle auricular protocol developed by the National Acupuncture Detox Association. The five points in each ear ease cravings and the emotional roller coasters of addiction and withdrawal, and also provide potent treatment for post-traumatic stress disorder. The five-needle protocol treats sleep disturbances, depression and anxiety, often achieving instant results. In a free drop-in clinic in East Vancouver last summer, three times per week for over a month, two acupunks treated several dozen people dealing with the emotional, psychological and physical consequences of violence and incarceration as a result of police brutality at the G20. People who arrived stressed out, anxious and in pain received acupuncture (many for the first time) and experienced deep relaxation sitting on couches and folding chairs arranged in a loose circle. Worldwide resource depletion, austerity measures and increasing state repression are creating the need for simple, creative and unconventional ways of taking care of each other. Community acupuncture and other alternative healing methods are a growing part of radical liberation movements as the focus increases on not only dismantling repressive structures but also on actively building a more just and gentle world. Acupuncturists were on hand in the wake of Hurricane Katrina, in Haiti after the earthquake and in New York after the 9/11 attacks. Community acupuncture was also available after Vancouver’s Transgendered Day of Remembrance in 2010, and at an event in connection to the Womens’ Memorial March in February 2011. It was offered with the understanding that these memorial events, while important for the healing of the community, are potentially re-traumatizing. Lisa Baird is a spoken word poet and acupunk in Vancouver BC. Submitted by justin on Wed, 2011-04-27 19:03. Submitted by Tami Starlight (not verified) on Wed, 2011-04-27 20:46. It is an honor to share our paths. Only recently have I come to feel how important this "self care" truly is. Submitted by Anonymous (not verified) on Thu, 2011-04-28 14:17.
what ever happened to the simplicity of meditation, for 20 years I have reached the state that most can only reach by drugs, mushroom kind. I achieved with the simplicity..why is the human being so damn lazy and going to jump on the band wagon of new medical treatments..costing and paying these sudoist a living, inconcievable. sheep eah, baaaaa. my health is forever calm, even in this storm the waters around me are calm, love is seen in everything as the field. Changes in this world happen when the hearts change towards compassion and love for the balance out of a tippy world of greed. Why did anyone every allow our political climate to get out of control, people hold the power and gave it away. this is the great depression oppressing everyone. Submitted by Masaaki Kuroiwa (Mr.) (not verified) on Mon, 2011-05-02 19:47. Good to know that this kind of community acupuncture is practiced in Canada. I would like to visit there and experience the calming atomosphere for frustrated and imbalanced modern poeple, as a Japanese acupuncturist practising in Kawasaki,Japan.